After the Civil War, John Jefferson Beagles, subject of previous post, and his family made their home in Alachua County, Florida and took their mail at Gainesville, FL. He was enumerated there in 1870 as Jefferson Beigle. The confusion over the family surname seems obvious, and additional recorded variations of the name include Bigles, Beigles, Beacols, Birgles, Bugles, or Beagley. No doubt, the illiteracy of John Jefferson Beagles and Nancy Catherine Wright was a contributing factor in the proliferation of Beagles variants. John Jefferson Beagles and Nancy Catherine Wright Beagles. 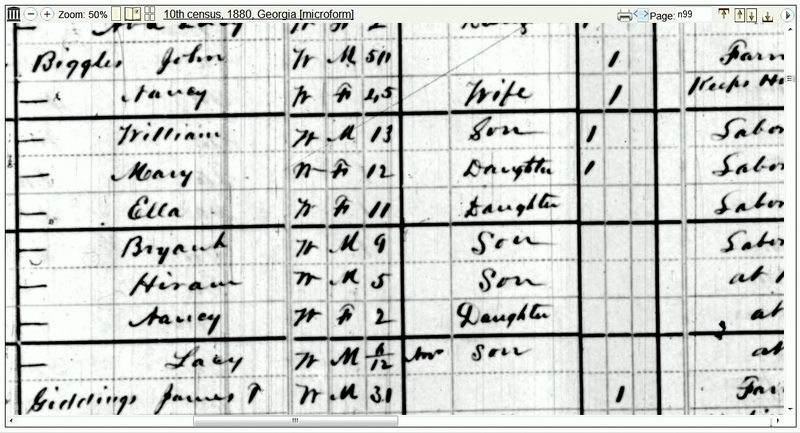 (Image courtesy of Berrien County Historical Foundation http://berriencountyga.com/)C 1870 Census enumeration of John Jefferson Beagles and family. 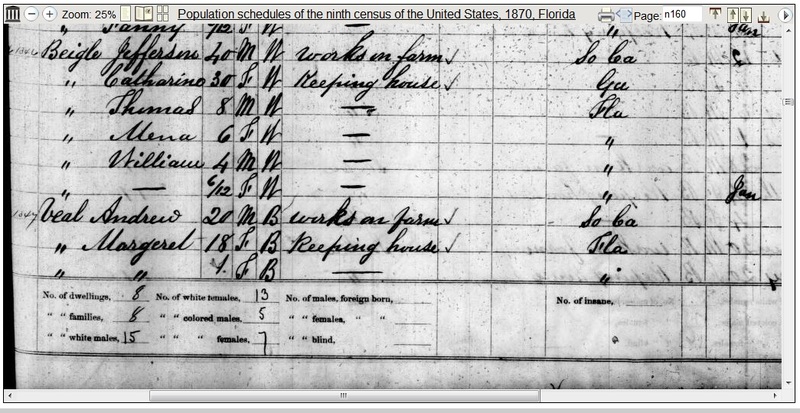 1870 Census enumeration of John Jefferson Beagles and family. The previous post gave the account of John Jefferson Beagles Confederate service, and his time in the Pioneer Corps. The 1870 census enumerated John Jefferson Beagles at age 40. He was working on a farm in Alachua County, FL. His wife, Nancy Catherine, age 30, was keeping house. Living with them were their children Thomas, Mena, William, and as yet unnamed infant daughter Mary. 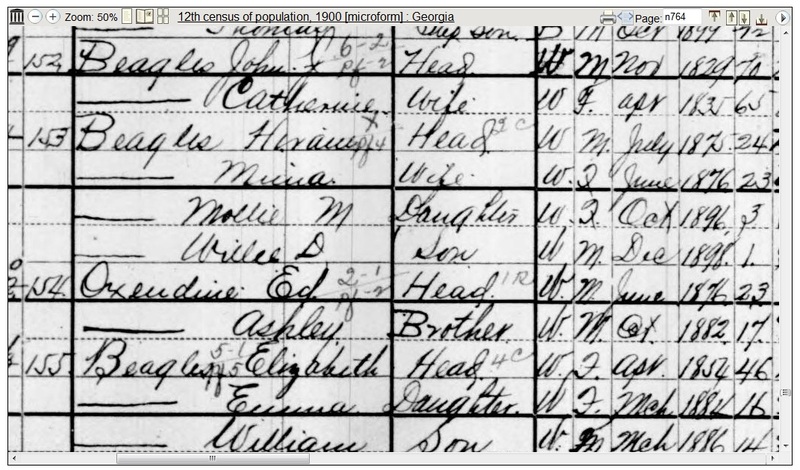 1870 Census enumeration of John Jefferson Beagles and family. By 1880 the Beagles relocated to Cat Creek, about 10 miles southwest of Ray City. Their home was in Lowndes County, in the 1307 Georgia Militia District. 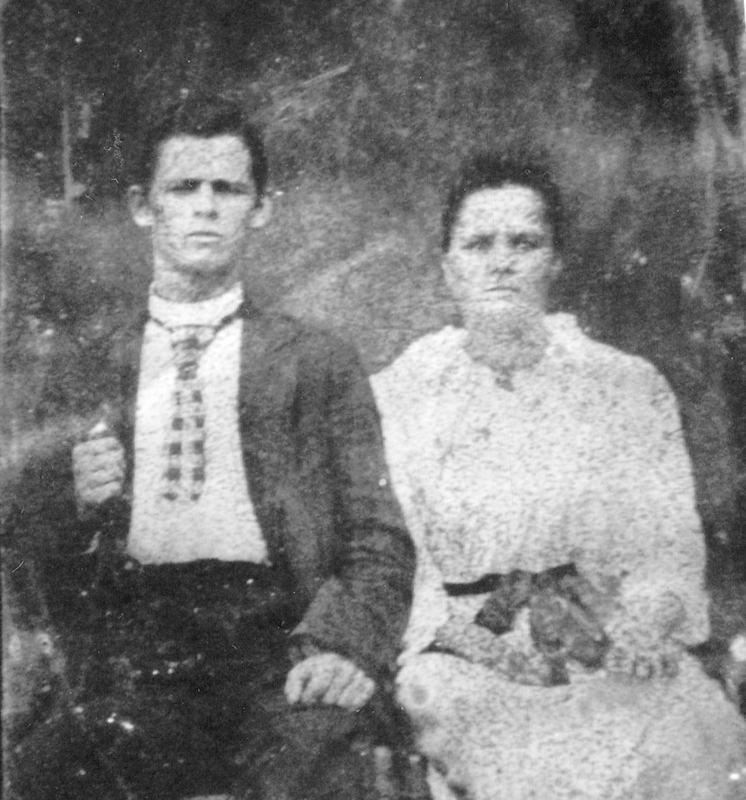 John Jefferson Beagles was enumerated as “John Biggles,” with his wife, Nancy, and children William, Mary, Ella, Bryant, Hiram, Nancy, and Lacy. In 1887 John Jefferson Beagles and his son, James Thomas Biggles, were involved in a family quarrel with in which James shot and killed his brother-in-law, Madison Pearson. The shooting occurred at H.H. Knight’s store in Rays Mill, GA (now Ray City). Afterwards, J. J. Beagles helped his son to escape the crowd that witnessed the killing. The younger Beagles fled the area but eventually returned to Berrien County to stand trial before Judge Augustin H. Hansell. James Thomas Beagles was convicted and sentenced to serve time in the convict camp at Fargo, GA. In 1900 John J. Beagles was enumerated in the 1144 Georgia Militia District, the Rays Mill district. At age 70, he was working as a brick mason. John and Nancy were living in a rented house. Their son, Hiram, was renting the house next door. 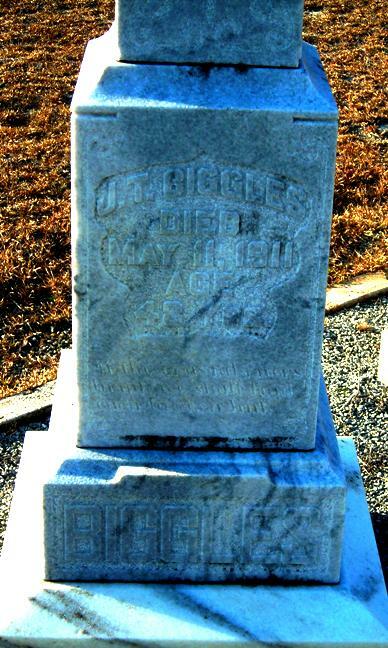 Grave marker of Nancy Catherine Wright Biggles, Beaver Dam Cemetery, Ray City, GA. In 1903, J. J. Beagles was left a widower when his wife of 42 years died. Nancy Catherine Wright Beagles died on the 5th of January. 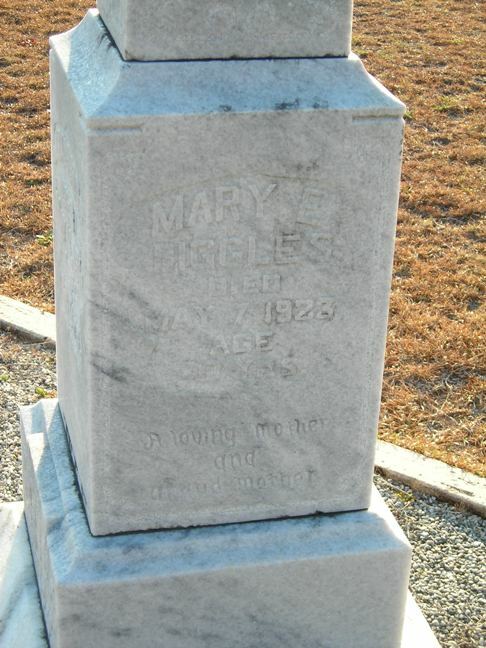 She was buried at Beaver Dam Cemetery, Ray City, GA. 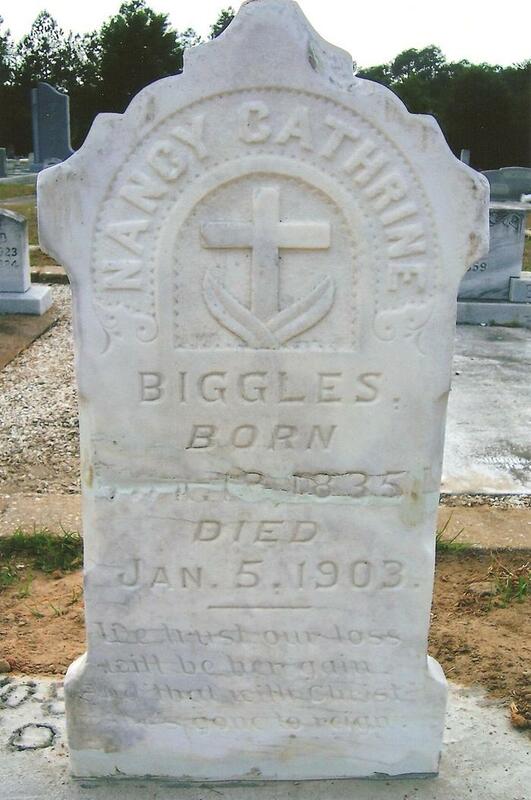 Her grave marker bears the surname, Biggles. The census of 1910 shows the widower J.J. Beagles was back in the Cat Creek District. living in the household of his son, L. O. Beagles. At 81, the senior Beagles was still working on his own account as a brick mason. Some time before 1920, John Jefferson Beagles died. He was buried at Beaver Dam Cemetery, as stated above. In 1880, Needham W. Pearson deeded 80 acres of land to his daughter, Elizabeth Pearson Biggles. She was the wife of James Thomas Biggles, subject of the previous post. About 1901, James Thomas Biggles returned to the Rays Mill area after completing a prison term in the Fargo Convict Camp for the murder of his brother-in-law, Madison G. Pearson. 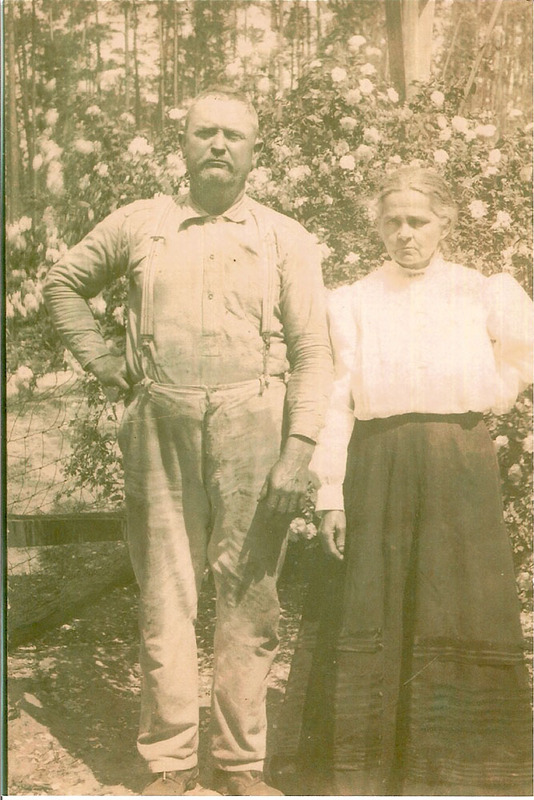 Re-joining his wife, Biggles purchased an 100 acre tract, adjacent to her land, from Eugene M. Giddens. This tract had been in the Giddens family since the early 1800s. 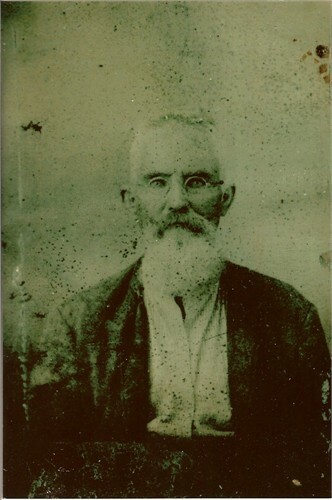 Isbin Giddens brought his wife, Keziah, and their two young children, William and Moses Giddens from Wayne County to settle in what was then Irwin County, near the present day Ray City GA in the winter of 1824-25. Present day county lines place the land in Lanier County, about 6 miles east of Ray City and just north of Highway 129. After the death of James Thomas Biggles in 1911, the 100 acre tract that was in his name was sold at an administrator’s sale to J. V. Talley. The 80 acre tract was sold in 1924 by the heirs of Elizabeth Pearson Biggles, following her death in 1923. About that time Dr. Reubin Nathaniel Burch acquired both the 100 acre and the 80 acre tracts from different owners. Dr. Burch sold the property about 1930 and it was eventually accquired by the Roquemore family of Lakeland, GA for turfgrass production. In the winter of 1887, a family feud at Rays Mill, Georgia turned deadly when J.T. Biggles gunned down Madison Pearson from the porch of Henry Harrison Knight’s store. At that time Knight’s store was one of the few commercial establishments at Rays Mill and was a community meeting place. The store was situated on present day Pauline Street, approximately opposite from the Ray City School. In front of the store was an area known as the “court ground” and the building served as the court house when there was need. Knight’s store was also occupied by Dr. Guy Selman, one of the first doctors in the area, and after David Ridgell departed in 1905 it was the location of the Ray’s Mill Post Office. 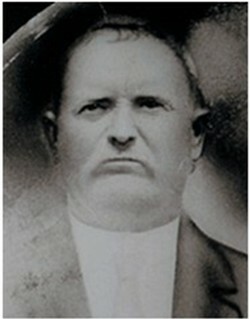 Henry Knight’s son-in-law, Cauley Johnson was postmaster. The building was destroyed by fire, probably in the 1940’s. J.T Biggles had a running feud with his brother-in-law, Madison G. Pearson. At first Biggles tried to work through the court, but he soon took the law into his own hands and murdered Pearson before a crowd of citizens. Biggles became a fugitive for twelve years before returning to stand trial. Terrible Result of an Old Feud. They started out. Beagly drew his pistol and fired upon him as he went out, and shot him dead the first fire, then took to the swamp and has not yet been captured. J. T. Beigles Kills Madison G. Pearson at Ray’s Mill – A Family Feud which ends in the murder of a Brother – in- law. Madison G. Pearson was killed by his brother-in-law, J. T. Beigles, at Ray’s Mill, in Berrien County, last Friday, the 4th, inst. A Family feud was at the bottom of the difficulty. Beigles had married Pearson’s sister. The mother of the latter lived for sometime with her son, but a family quarrel, it seems, drove her to her daughter’s home. After she took up her abode with the Beigles family, some questions arose about the division of her small property. One report says that she willed all she had to Mrs. Beigles, and thus aroused her son’s indignation, and another rumor says that Beigles killed a beef which belonged to the Pearson estate, and that this was the cause of the trouble between the two men. At any rate there was trouble between them, and the old lady took the side of her son-in-law. Pearson, it seems, made some threats, and Beigles had him arrested under a peace warrant. Friday, the day of the tragedy, was set for a hearing before the Justice of the district, and Beigles and his wife and old Mrs. Pearson appeared at the Court ground at Ray’s Mill as witnesses. The bailiff had Madison Pearson under arrest, and the parties at interest, and about forty interested neighbors, all met at Mr. H. H. Knight’s store. Beigles’ father was among those present, and he approached Pearson about a compromise, but Pearson thought he had been greatly outraged, and freely expressed his indignation. He refused to accept the proposals made by the elder Beigles. A witness to the whole affair at the Court grounds informs us that the elder Beigles’ attitude and manner was not such as indicated any real desire for a fair compromise, and that his actions and his words were the immediate cause of the conflict, if it can be called a conflict. In reviewing the difficulty, the elder Beigles, who was standing between his son and Pearson, made some assertions which the latter vehemently denied or disputed, and the younger Beigles shouted to Pearson that he was a liar. At this Pearson, replied hotly that if Beigles would step with him to the ground from the porch upon which they stood, he would whip him, and as he spoke he sprang off at right angles from Beigles, but he struck the ground a dead man. Beigles fired at him on the spring, and the ball entered the side of the head near the left temple. Pearson doubled up as he lie fell and his head hit the ground first. He never spoke a word, and died in a few moments. Pearson had two brothers on the spot, and one ran to the dying man and the other started upon Beigles, but he met a cocked pistol in his face, and was warned to stand back, or else share the fate of his brother. Beigles kept his face to the awe-stricken crowd, pistol drawn, while his father pushed him backward some thirty feet, then he turned and they both fled. There was not a gun or pistol on the hill that could be found, and the two Beigles escaped. A pursuit was quickly organized, but they had gotten out of sight, and are yet at large. Pearson was not armed. Pearson’s mother and sister witnessed the murder of their son and brother, so an eye witness informs us, without shedding a tear. After some little time Mrs. Pearson walked up to the dead man laying upon the ground, and stooped down and kissed him. She then rose calmly and walked away without any signs of emotion. Thus a Justice’s court was sadly and suddenly transformed into an inquest court. The coroner lived forty miles away, and the bailiff, who held Pearson in custody as a prisoner when he was killed, summoned a jury, and the Justice, who was about to convene his court to try Pearson on a peace warrant, instead of proceeding with the trial, swore in an inquest jury to sit upon the dead body. After swearing numerous eye witnesses the jury found that the killing was done as outlined above, that the same was willful murder; also that the elder Beigles was an accessory to the dead. We are indebted to a neighbor of the parties, and an eyewitness to the tragedy, for the above statement of the circumstances connected directly and indirectly to the killing. All the parties were sober. In 1899 the Valdosta reported the follow up on the trial of the Biggles case. BERRIEN SUPERIOR COURT. CONCLUSION OF THE BEAGLES-PEARSON CASE. Berrien Superior Court after a four days’ session adjourned Thursday afternoon. The session was devoted entirely to criminal business, no civil cases being called. The principal case of importance was the trial of Madison G. Pearson, Nov. 4, 1887, twelve years ago as was stated in Friday’s Times. 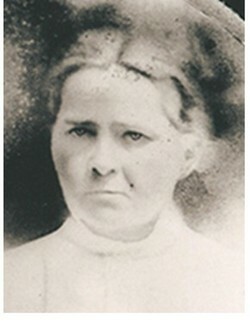 Beagles was married to Pearson’s sister, and there had been considerable bad blood between them, culminating when Mrs. Pearson left the home of her son and went to live with her daughter, Beagles’ wife. Pearson threatened to kill Beagles on several occasions and a few days before his death went to Beagles’ house and cursed his wife and children. Beagles then swore out a peace warrant for Pearson, and he was arrested under it and carried to the Court House at Ray’s Mill for trial. A large crowd was on the court ground, among them Beagles, and Pearson challenged him for a fight, pulling off his coat and starting out the door as he did so. Beagles was standing on the porch of the house, within a few feet, and as Beagles stepped out fired at him, shooting him through the head, the ball entering just in front of the right ear and coming out behind the left ear, producing instant death. Beagles skipped the country, and spent several years in Florida, returning just before his arrest. He was admitted to the bail, and staid under bond until two months ago, when his bondsman gave him up, and since that time he has remained in jail. At his trial he was represented by Col. Joseph A. Alexander of Nashville and W. H. Griffin of Valdosta, while the state was represented by Col. W. M. Hammond of Thomasville and Solicitor General Thomas. The trial lasted a day and a half, and every inch of ground was stubbornly fought. The principal evidence against the dead man was the ante-mortem statement of his own mother, made four years ago, which was exceedingly bitter in denunciation of her son. Six hours were spent by Cols. Griffin and Hammond in their strong and eloquent arguments of the case, and he jury remained out on it seven hours before returning a verdict of manslaughter with recommendation to mercy. Col. Griffin made a touching appeal to the court for mercy, and Judge Hansell fixed the sentence at two years in the state penitentiary. 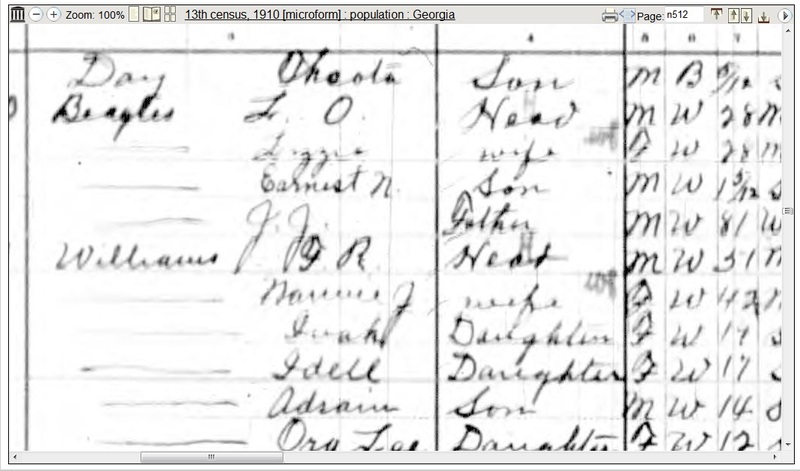 In the U.S Census of 1900 James T. Biggles was enumerated on June 23, 1900 as a convict in the Fargo Convict Camp in the Jones Creek District of Clinch County, GA. In 1910, the Biggles were back together in Rays Mill, GA where they were enumerated with several boarders living in their household. James Thomas Biggles died May 11, 1911 in Ray City, Berrien County, Georgia. He was buried at Union Primitive Baptist Church Cemetery, Lakeland, GA. On his tombstone his name appears as J.T. Biggles. Georgia, Berrien County. Will be sold before the court house door on the first Tuesday in October the following land: 1/2 acre of land in the town of Milltown bounded east by lands of M.E. Patten, south and west by lands of R.L. Patten, north by old Brunswick & Western right-of-way on which is situated one gin house and one barn, five double Foss gins, one short cotton gin, one conveyor, one double Monger box press, one seed conveyor and all belts and pulleys now used in the gin house. Terms cash. Sept 5, 1911. M.W. Bargeron, W.A. Biggles, Administrators of Estate of J.T. Biggles.